JJ Charleworth's recent Mute article about the ICA's severe financial problems is well worth reading. In it he dismantles Ekow Eshun's cynical attempt to blame the institutes's problems solely on the recession. He also takes Eshun to task for his attempt to turn the ICA into a "more fluid and decentred model of arts presentation" as opposed to a boring old (modern) art gallery. Charlesworth identifies an insidious New Labour rhetoric of anti-elitism behind Eshun's plans (an issue expanded on by Mark Fisher in this piece). In this schema arts institutions are required to become hip, flexible concerns un-encumbered by too much in the way of permanent staff or collections or any of that fusty old nonsense. At the same time, an expensive new tier of bureaucracy is required to chase sponsorship and new business opportunities. Such a model has, of course, more or less taken over all artistic institutions and activities as well as hospitals, schools and universities. It follows the way that professional expertise has become systematically devalued in the new landscape of project management and bureaucratised capitalism, replacing it with endless targets and organisational procedures. Like most professions, architecture too has become increasingly commercialised over the last thirty years in ways ranging from the small - being able to advertise - to the more fundamental - such as the co-opting of the architect's traditional role by project managers and cost consultants. Obviously this marginalisation reflects the wider shift from the post-war consensus of welfare state paternalism to the corporate culture that has permeated every area of contemporary life. But to stick to architecture for a moment the interesting thing for me personally is how this corporatism has taken place over the course of my educational and professional life. When I was studying in the early 1990's architectural education had just been through a radical shift from the pedagogical certainties of modernism to the multiple strands of post-modernism. Gender studies, queer-theory and all sorts of other strands imported from cultural theory were undermining the supposed certainties of modernism and re-reading its critical canon. Alongside the functionalist and anti-decorative aspects which had already come under fire from post modernism, modernism was being critiqued for its paternalism, (too many dead white men) and its suppression of the psychological and political complexities of space. The result was a splintering of any consensus as to how to teach architecture and a consequent embracing of pluralism and diversity. This pluralism found its most obvious form in the 'unit' system of teaching, where students choose from a menu of tutor groups at the beginning of term, each with their own singular agenda and interest area. From within the teaching establishment this breakdown into atomised tutor groups has been seen as both an unquestionably good thing and one motivated by cultural as opposed to economic goals. Viewed from afar though it might not be so clear. 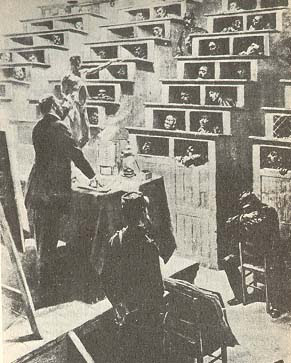 The Unit teaching model was made popular at the Architectural Association in the 1970's with its panoply of rising stars all using teaching as a platform from which to launch their stellar careers. The AA - being a private fee paying school - has always had a unique culture, but during the 1980's and '90's its unit system of teaching became adopted - to a lesser or greater extent - by pretty much all UK schools of architecture. This has coincided with a downsizing of full-time faculty staff, who have been replaced by a shifting army of part-time design tutors. The unit system as propagated at the AA was always a somewhat ruthless exercise that mimicked free-market economics. If a unit wasn't popular with students then it was likely to face the chop. Despite the obscureness of the subject matter offered by each tutor a certain ruthless populism underpinned the whole enterprise. At the AA, its reputation for providing a gallery of star tutors for students to choose from guaranteed an intense level of competitiveness. At less well resourced schools of architecture the adoption of the unit system has resulted in less obviously useful results. That's not to say that there isn't a lot of value in the unit system, or that it's entirely venal in its motivations. Far from it in most cases, but the shift in teaching culture has undoubtedly been expediently useful for universities, allowing them to reduce their staffing levels whilst seemingly offering more choice and diversity. The process might not have originated with market economics but, in some ways, they underpin it as much as theoretical ideas about the dismantling of modernism. The incorporation of the rhetoric of choice within the internal teaching methodology of architecture schools has mirrored a wider shift in higher education where universities now offer products and services to customers as opposed to courses to students. What's more the upcoming enormous slashes in higher education budgets will no doubt be easier to execute with fewer full time members of staff to expensively sack. Not only that, but the air of intense competitiveness it generates must surely help prepare the ground for the way that architects are forced to win work. Increasingly, clients ask for levels of unpaid work up front in the form of mini-competitions that force architects to fight ever harder amongst themselves for work. A risk-averse culture, combined with the kind of layers of bureaucracy that Fisher identifies, means that no one is prepared to simply hire an architect based on knowledge of their previous work. Instead, architects have to bid for work by completing a large chunk of it at their own risk whilst competing with other firms to offer the lowest fee. Of course, the language of corporatism has permeated architecture beyond education in much more obvious and well-documented ways. From the endless insistence on Best Value to the ruthless way that architects are employed by sophisticated developers, architecture is forced to play within a very particular economy. Successful architects - ones with work - have learnt to negotiate this culture, able to squeeze the architecture in amongst the net to gross ratios and talk of retail offers. The rhetoric of partnering that resulted from the 1994 Latham Report (in an attempt to make construction less confrontational) has only made this situation worse. On the face of it the report was an eminently sensible set of objectives that no right thinking person could object to, an attempt to reduce confrontation in the notoriously litigious construction industry. Like all eminently sensible things though it is a smokescreen of reasonableness obscuring a deep ideology. The idea of partnering is flawed for most architects simply because their values are not shared by other members of the construction team. What partnering usually means is a victory for the model of economic efficiency that all partners have to sign up for. If design has a place in partnering agreements it is usually a mealy-mouthed commitment to 'design quality'. In reality, the tenets of value-for-money, efficient supply-chains and risk-free construction come to bear on the design process at an ever earlier stage. This results in the creation of the monstrous and horrifying term Value Engineering, a notion that all architects now have to sign up for that commits them to a continual search to find a cheaper solution. The possibilities for architecture as a cultural act are progressively squeezed out by the need to prove that cheaper and quicker options have been explored at every available opportunity. An American friend said recently commenting on another blog how shocked he was by the extent to which the RIBA had swallowed the rhetoric of project manager business speak. None of this is news of course and much of what I've said is the perennial subject matter for RIBA conferences and the AJ letters page. That I've ended up here doing the same after years of denigrating the stuffy old RIBA is ironic and, possibly, highly predictable. As a student, one of my tutors wrote a book based around the death of the architect. It critiqued the RIBA's jealously guarded professional (self) interests and proposed the slow collapse of its Portland Place headquarters. At the same time, I was designing an alternative home for, of all places, the ICA, hidden in the left over spaces of the National Gallery. The projects flip solipsism would, no doubt, have appealed to Ekow Eshun. All fair enough, but in the rapacious value less terrain of financial deregulation, the soft paternalism of professional knowledge suddenly seems enormously important.